Moving to a new home is an exciting time, especially when you are purchasing your first home or looking forward to a new job and career opportunities after you relocate. Finding the best Rockville movers is possible by conducting a bit of research before settling on a moving date that is best for you and your household. Doing this research beforehand can aid you in preventing a costly horrible moving experience. Before choosing a local moving company near Rockville, research all available providers near you. Make sure they have an address and DOT# listed, insuring their reliability. Ask for referrals from family members and friends while also conducting a bit of your own research online. Search for top moving companies near the Rockville areas using top search engines such as Google, DuckDuckGo, Yahoo!, and Bing. Learn more about each individual moving company near you by visiting the official website of the business or by viewing social media pages that are available and active. Always read reviews and client testimonials left by individuals who have used a moving company you are considering in the past. Client testimonials provide valuable insight into the inner-workings of a business including costs, customer service, and the overall quality of the job they get done. Learn which moving companies near Rockville pride themselves on customer satisfaction and getting any moving job completed in less time and without a hassle. A company that does not currently boast any reviews is much more difficult to trust, especially when you plan to move an entire household of furnishings and personal belongings. Call moving companies in Rockville directly to inquire about the licensing and insurance they currently hold as a business. Companies that are licensed and insured do not avoid phone calls or requests to prove their legitimacy. Ask to receive licensing and insurance paperwork via mail or fax or by visiting the local office of the movers of your choice. Verifying that a moving company is licensed and insured is imperative to avoid potential financial risk or losing out if your property is lost, damaged, or stolen during your move. Research local moving companies near you online with the BBB (Better Business Bureau) to learn more about the licensing and insurance each business near you holds. Additionally, utilize the BBB to discover any reports or complaints made against the moving company you are interested in hiring to help with your upcoming move. Always request an in-home estimate before choosing a moving company to trust and rely on once your moving day arrives. In-home estimates are optimal when you have a strict budget set in place for moving expenses (including transportation, labor, food, and lodging if necessary). Even if you provide moving companies details regarding your home and the amount of furniture you have to move over the phone, an in-home estimate is often much more accurate in terms of total moving costs that are required to complete the job. An in-home estimate is also recommended if you want to learn more about the company you have chosen to help with moving day. Ask questions and inquire about special tools and equipment that are necessary to ensure the protection of your furniture and belongings at all times. Overestimate the total costs you intend to pay for your move, especially if there is a delay in moving furnishings and belongings due to traffic, weather, or unexpected and unforeseen events. Many moving companies charge by the hour, although it is possible to seek a flat-rate solution depending on where you currently live. Review all of the moving services provided by local moving companies you are interested in to find the very best deal while alleviating as much stress as possible from the actual move itself. Compare local moving companies and the type of amenities or services they provide to feel comfortable with and confident in any decision you settle on for your upcoming moving date. Seeking out the best movers in Rockville both locally and online provides you with more options to choose from before making a decision. Taking the time to review and compare all of the local moving companies near you in Rockville help to smooth the relocation process whenever you are set on purchasing a new home or place of living. Our staff and crews are highly trained in the art of moving and customer service. 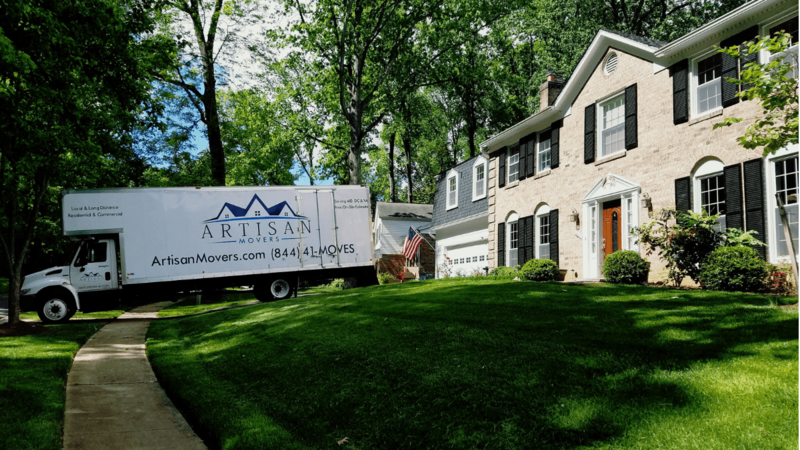 If you decide to book your next relocation with Artisan Movers you will truly experience the difference in what we consider the ultimate moving experience. We aim to offer a reliable relocation experience through constant communication ensuring you a seamless and relaxing transition into your new home or business. Contact us today if you like an estimate on your upcoming move. We promise you won’t be disappointed.